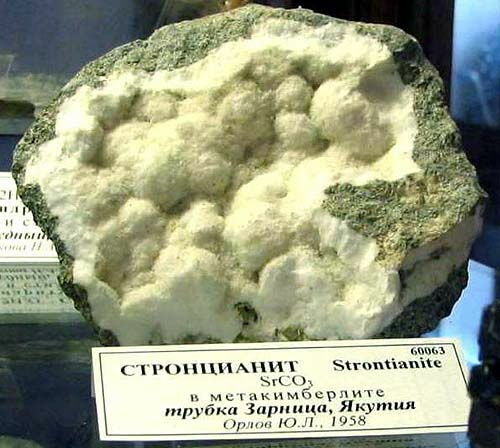 Strontianite is a carbonate of strontium. Glance (glitter, glare) glassy, fatty. Transparent to translucent. Colors: greyish-white, rather yellow; there are aquatic-transparent colourless differences. A line is white. Fracture, break padman. Fragile. Cleavage perfect absolute. Paints flame in a carmine-red color. Appears in cracks in limestones and marls. Crystals (rhombic Crystal structure) of bipyramidal, needle, and also radiant or fibred aggregates. Places of distribution: Garc (Germany, Germany), Tyrol (Austria), Scotland. Sometimes he was named by Strontianite. It is crystallized as needle-shaped crystals, rarely single. More frequent it bundle-like and sheaf-like aggregates; the masses of dense or grainy addition are yet more ordinary. Mineral of fragile frail brittle, easily divided on the planes of cleavage parallell to the verges of vertical prism. Mainly Strontianite of white color, but in his colouring can be present rose, grey or green tint; in powder triturate he white. A mineral is transparent or examines with x-rays, brilliance of glassy. Chemical composition (chemistry, compound). Strontia (SRO) 70,2%, dioxide of carbon (So2) 29,8%. form of crystals. Dipyramids, spear-shaped and needle-shaped crystals. Crystalline structure. 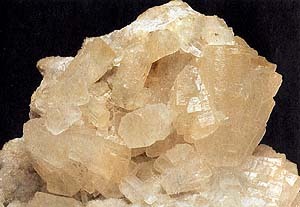 Grate of type of aragonite. Class of symmetry. Rhombo-bipyramidal group- mmm. Cleavage. Shows up rarely, in these cases distinct to on (110). Aggregates. Dense, fibred, radiant. A white, lightly coloured, or colourless mineral consisting of strontium carbonate in orthorhombic crystalline form: it is a source of strontium compounds. Formula: SrCO3. Under the action of ultraviolet rays Strontianite can fluoresce blue light. At heating property of thermoluminescense is sometimes revealed. Dissolves with boiling up in cold dilute muriatic acid. Powder of mineral, placed in flame, paints him in a carmine-red color, that talks about the presence of strontium. At strong burning mineral upwarps, becoming look like the head of the coloured cabbage, shines brightly, painting flame in a carmine-red color. A behavior is in acids. Easily dissolves with boiling up. 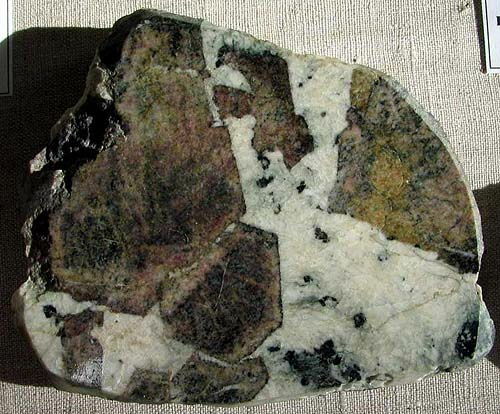 In Stronciane (Scotland) mineral be found in vein, lode, mines in an association with galena, galenite and barytes. Beautiful crystals meet in Australia and Freyberge (Germany). In Italy Celestine is marked in a negligible quantity in a barytes mine near Porto-Serezio (province Varese). Large deposits, developed by an industrial method, are known in Vestfalii and Garce (Germany), Spain, Mexico and Strontien-Hills in California (USA). Strontianite is ores on strontium. This element is used in pyrotechnics (from his ability to paint flame in different colors), in saccharine industry and at the production of the special glasses. Strontianite in metakimberlite. A kimberlite tube is Zarnitsa, Yakutia, Russia, CIS. Strontianite with bastnaesite and chlorites on berbankite. Mountain Lake, Aldan, Yakutia, Russia. A photo: © A.A. Evseev.